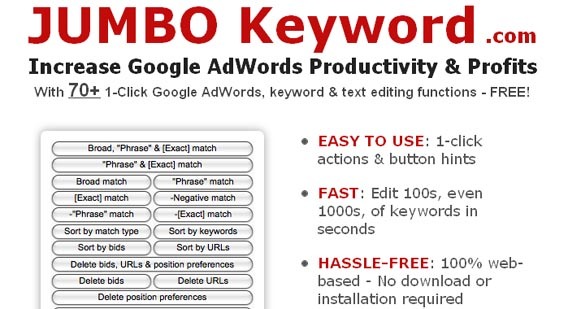 Google AdWords Keyword Tool With 70+ 1-Click Editing Functions That Edits & Cleans AdWords Keywords - Fast! We all know about the importance of keywords to Internet marketers. It can be a very time-consuming process to go through all that research and testing, trial and error. It can be a lot of work, so any help in the right direction can be very much appreciated. While Jumbo Keyword won’t be able to provide you with lists of highly profitable keywords, it will be able to streamline the process of generating your AdWord campaigns. Over the course of this review, you’ll learn some of the cool benefits that you can gain from using this online tool. If Jumbo Keyword isn’t there to generate keyword suggestions or provide you with important statistical data, what exactly does it do? Checking out the About Page, we learn that Jumbo Keyword is a web-based software application that can help you create, manage and edit thousands of AdWords keywords quickly and easily.